Back in 1915, when the powers-that-be changed the name of the town of Fig Tree Island to Satsuma, women were marching in the streets of New York City for the right to vote, Alabama had been a state for almost a century, Woodrow Wilson was president and our nation had not yet entered “the war to end all wars” in Europe. 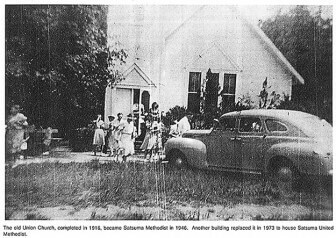 (Photo/Courtesy of Jo Anne McKnight) Satsuma’s old Union Church was completed in 1916 and became Satsuma Methodist. Family life in the South was pretty much the way small town living was portrayed on “The Andy Griffith Show” — everybody knew everyone else, entertainment was a guitar and sing-along on the front porch, and children made up their own games. 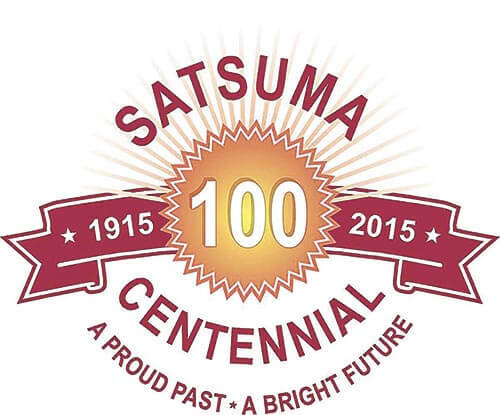 Or so believe the organizers of the Satsuma Centennial Celebration taking place the week of Oct. 5-10. Church was a vital part of the community at the turn of the 20th century, and Mary Atchison, chair of the Satsuma celebration, said the first event on the Centennial calendar is a “Bless the Tie that Binds” breakfast. That event, to which everyone is invited, will be held at 7:30 a.m. Oct. 5 at First Baptist Church of Satsuma. 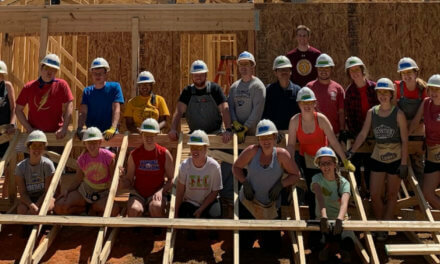 Three Satsuma High School alumni will be featured, including soprano Dr. Kimberly M. Davis and keynote speakers Dewana Banks and Dan McConaghy. The speakers will share a historical event with the audience and then, three longtime residents will be honored. All current Satsuma residents and Satsuma church members are invited. Satsuma City Hall will be the setting for a “Profile in Courage” tribute on Oct. 6 at 10 a.m. Two 1973 graduates of Satsuma High School will be recognized for their roles in the town’s history. The movie “The Help” will be shown at this open-to-the-public event. In the decade between 1912 and 1924, cold weather and citrus canker fairly well destroyed the satsuma trees that had been introduced to Alabama from Japan in 1878. But the town didn’t change its name this time, and for many years has selected a “Miss Satsuma” beauty queen to represent the city. On Oct. 7, all former title holders are invited to a “There She Is — Miss Satsuma through the Years” tea at the high school. A “Home Sweet Home” Southern supper is planned at 6 p.m. Oct. 8 at Steele Creek Lodge. 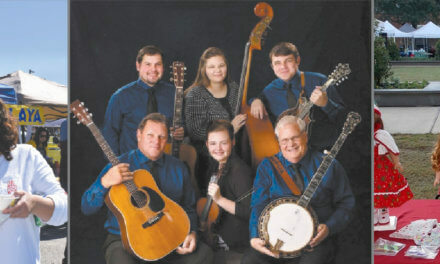 Still incorporating the family theme, this event includes the meal plus music by the Kempters, a family whose members all sing and play an instrument; their genre is gospel and contemporary. According to Mary Atchison, this evening of food, fun, fellowship and music is well worth the $15 ticket (available at McConaghy Drugs). 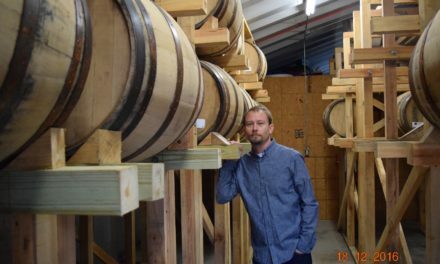 A special feature of the evening will be when the two oldest families still living in Satsuma are honored, along with the oldest continuing business. The “Life in 1915 Ladies Porch Party” on Friday, Oct. 9, is rather exclusive. 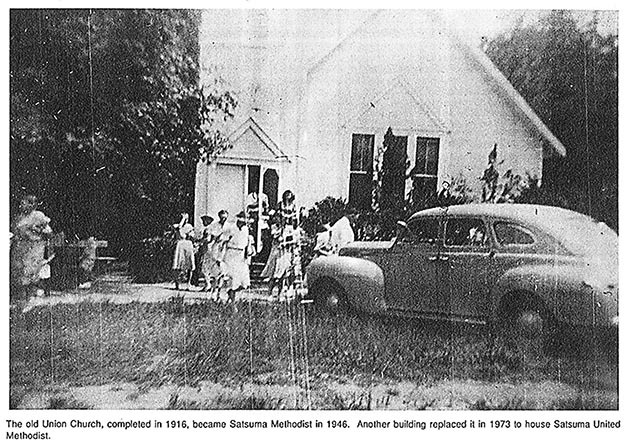 Honoring the First Ladies of Satsuma, only 40 women who are current residents can be accommodated. But just wait! Everybody is invited to the party in Baldwin Square on Saturday, Oct. 10, 9 a.m. until 12:05 p.m. There surely will be special guests at this “It Must be Mayberry, ‘Cause Aunt Bee, Andy, Opie, Barney and Floyd are Here” event. There’ll be games and contests with cash prizes — Barney’s 100-yard dash at 9 a.m., Opie’s sack race at 9:30 a.m. and Aunt Bee’s pie contest at 10 a.m. Miss Centennial will be crowned at 11 a.m. And for the next hour, guests can mingle and make merry in a town that has set the clock back a hundred years. For more information, contact Mary Atchison at maryednaatchison@yahoo.com or 251-626-0630.